I have collected classic cars for 35 years. This beautiflu XKE V12 is one of my personal collection I am selling, see others at, www.gccc.us. 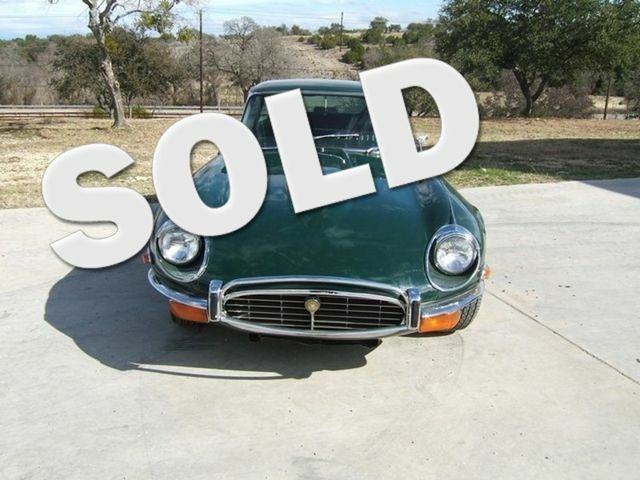 This 1971 Jaguar XKE V-12 coupe was purchased from a couple who had this car tucked away for a few years with only 46,500 original miles on it. CONDITION * Car #1S71180BW * Body # 4S051356 * Engine # 7S2575SA * Gearbox # 10723 * Mileage: 46,500 original. * Engine: Runs well * Transmission condition. : Good. * Brakes: Good . * Body condition / Paint : British racing green- Paint overall looks pretty nice. One snall 6" - 7" area passenger side rear tire area as picture shows, rust bubbles coming through paint. * Floors: Good condition. * Tires: Fair. * Interior : Black, some wear on seats. * Chrome: Presentable. * Exterior Rear trunk area: Good condition. * Complete Car : Yes. * Tools : No. * Jack : Yes. * Spare tire : Yes. * Car cover : Yes. .